SEATTLE, Washington, February 27, 2013 (ENS) – A U.S. appeals court has sided with the Japanese whalers suing the whale conservation nonprofit Sea Shepherd, overturning a lower court decision and declaring the Sea Shepherds to be pirates. “You don’t need a peg leg or an eye patch. When you ram ships; hurl glass containers of acid; drag metal-reinforced ropes in the water to damage propellers and rudders; launch smoke bombs and flares with hooks; and point high-powered lasers at other ships, you are, without a doubt, a pirate, no matter how high-minded you believe your purpose to be,” wrote Chief Judge Alex Kozinski of the Ninth Circuit Court of Appeals. The opinion of the three-judge appeals court panel comes in a preliminary injunction hearing against Sea Shepherd Conservation Society U.S. as brought by Japan’s Institute for Cetacean Research, a government-funded agency which runs Japan’s “research” whaling program. The Ninth Circuit Court issued a temporary injunction in December in favor of the Japanese whaling fleet enjoining the activities of Sea Shepherd U.S. in the Southern Ocean. 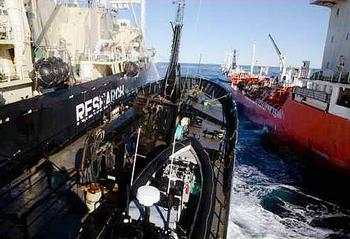 That ruling reversed a decision in Sea Shepherd’s favor by U.S. District Court Judge Richard A. Jones in March 2012. The Ninth Circuit originally issued the temporary injunction against Sea Shepherd with no opinion. In fact, the appeals court ordered that the case be sent back to the District Court but not to Judge Jones. and we so order,” stated the appeals court. The appeals court upheld the regulation of the International Convention for the Regulation of Whaling, which authorizes whale hunting when conducted in compliance with a research permit issued by a signatory such as Japan. The Institute for Cetacean Research has such a permit from Japan. “Nonetheless, it has been hounded on the high seas for years by a group calling itself Sea Shepherd Conservation Society and its eccentric founder, Paul Watson,” Judge Kozinski wrote. In consideration of the preliminary injunction granted to the Institute for Cetacean Research, Watson has resigned his leadership role in the Sea Shepherd Conservation Society. Avoiding extradition to Costa Rica on decade-old charges related to an anti-shark finning campaign, Watson jumped bail in Germany last summer. He is aboard the Sea Shepherd ship Steve Irwin in the Southern Ocean acting as an observer of this season’s Japanese whaling. Nisshin Maru, left, rams the Bob Barker into the refueling tanker Sun Laurel, February 25, 2013. In the Southern Ocean on Tuesday Sea Shepherd Australia successfully blocked a third attempt to refuel the Japanese whaling fleet, which must refuel at sea from a contract tanker because Australia no longer allows the whalers to refuel in Australian ports. Sea Shepherd maintains the whalers are illegally operating in contravention of an Australian Federal Court ruling prohibiting whaling in Australian Antarctic Territory. During the blocking action, the whale factory ship Nisshin Maru rammed the Sea Shepherd Ships Bob Barker and Sam Simon, photo evidence shows. Japanese harpoon ships trailed propeller fouling lines while crossing the bows of the Sea Shepherd ships and shot water cannon down the exhaust vents of the Steve Irwin, Bob Barker, and Sam Simon, attempting to flood their engines. All three engine rooms were flooded but had no mechanical failures. A Japanese Naval vessel is on its way to the scene of the conflict. The Japanese Maritime Self-Defence Force vessel Shirase (MMSI #: 431999533) is an icebreaker, designated as type ‘Military Ops.’ It carries 250 crew and three helicopters. It is 12,500 tons, 138 metres and can do 15 knots. Its last known port was Fremantle. Back in Seattle, the Institute for Cetacean Research sought its injunction from the U.S. courts based on three international agreements: the Convention for the Suppression of Unlawful Acts Against the Safety of Maritime Navigation, SUA Convention; the United Nations Convention on the Law of the Sea, UNCLOS; and the Convention on the International Regulations for Preventing Collisions at Sea. 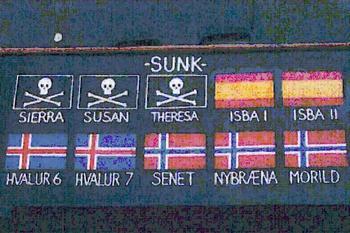 The SUA Convention prohibits acts that endanger, or attempt to endanger, the safe navigation of a ship. The Ninth Circuit recognized “uncontradicted evidence” that Sea Shepherd’s tactics could seriously impair the Japanese whalers’ ability to navigate. “The district court nonetheless concluded that, since Sea Shepherd has not yet disabled any of Cetacean’s ships, it’s unlikely it would succeed in the future. This was clear error,” wrote Judge Kozinski. Kozinski pointed to symbols painted on a Sea Shepherd vessel recording other whaling vessels the organization has rammed and sunk in the past as evidence that the whale defenders could do so again. Watson has repeatedly said that Sea Shepherd has never injured anyone in its campaigns and that it conducts its “symbolic” whale defense activities so as not to hurt people, but just to damage property. For its part, the Sea Shepherd calls the Japanese whalers pirates. “Japan’s whale-poaching pirates of greed are literally getting away with murder – the murder of whales,” the group said in a statement today. “If you are violating international law on the high seas, you are a pirate,” Kennedy said. “He is performing a profound public service for all of us and instead of recognizing him, the U.S. government, various agencies of the U.S. government, have attempted to impede him,” Kennedy said. Sea Shepherd attorneys have called for the case to be reviewed again before an 11-judge Ninth Circuit Court panel and a hand-picked judge of the U.S. Supreme Court. A first foray to the designated Supreme Court Justice was denied earlier this month. “We will continue to use the courts and the law to overturn these rulings,” said Charles Moure, lead counsel with Harris & Moure of Seattle. “We have a long, hard fight ahead of us but Judge Jones was correct when he said Sea Shepherd is working in the public interest for the greater good. Sea Shepherd has the court of public opinion on its side, backed by thousands of supporters worldwide, something the Japanese whale poachers will never have,” said Moure. Established by Watson in 1977 in Vancouver, Canada, Sea Shepherd Conservation Society has grown into an international non-profit, marine wildlife conservation organization with a fleet of four ships, a helicopter and unmanned aerial vehicles. 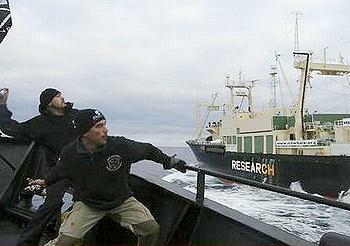 This is the group’s ninth season of action in the Southern Ocean opposing the Japanese “research” whaling fleet. Its activities are documented on the Animal Planet TV series “Whale Wars” on the Discovery Channel. Its mission is to end the destruction of habitat and slaughter of wildlife in the world’s oceans in order to conserve and protect ecosystems and species.